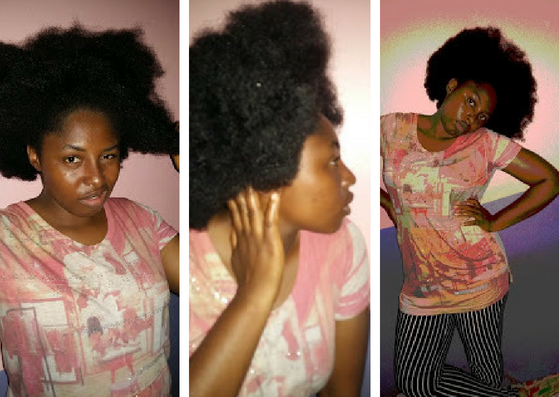 Shades of Us: I AM MY HAIR….AND SO MUCH MORE! I AM MY HAIR….AND SO MUCH MORE! What my hair looks like most days. One of my all-time favorite songs is ‘I Am Not My Hair’ by India Arie featuring Akon. It was a song that was as necessary as it was deep. India Arie addressed some of the issues faced by African Americans, especially as it related to hair. India Arie and Akon spoke about different hairstyles the typical African American has had to try, stick to or dump just to fit in to the rigorous demands of a society that is racist to black people. Having done all that, she came to the conclusion that she was so much more than her hair. It is easy to take the lyrics literally and assume she was just talking about hair but the detail is in the depth. That song has been a great inspiration in every area of my life. At this point in my life though, I believe it is time to change the lyrics of this iconic song a bit. 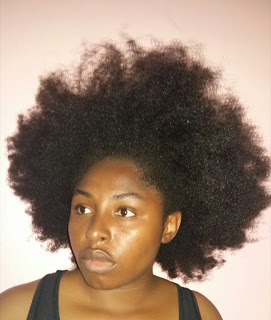 It should go like this; I AM MY HAIR…AND SO MUCH MORE! You may be wondering why I am taking that stance. I will explain in a minute. I always had long hair. It is not as long as I want it to be but it is long regardless. Okay, conceited Ramat! No need to rub it in! When I was younger, my hair was much softer than my sisters’. That isn’t to say that it isn’t still as bushy and thorny as your typical African hair. I remember when we were younger and would go to braid our hair and have the women complain about our ‘iron sponge’ hair. In fact, we were usually charged higher than other ladies because of our hair. When I was about 10 and saw girls with ‘relaxed’ hair, I wanted hair like that! I knew it would save me a ton of trouble if my hair was smoother, straighter and less of a ‘bush’. I suggested to my mum that she lets us relax our hair. The look she gave me was enough to melt frozen butter. I jejely carried myself away from her presence. No need to add a knock to an already tender head. When I got to the university, I finally relaxed my hair! The process was painful; excruciatingly so. My scalp was burned and each time the conditioner came in contact with the open wound, I would wince. The feeling was worse when they used water. When they finally washed the relaxer out, I had to grit my teeth to prevent myself from crying. In summary, it was really awful! When they were done though, my hair was silky soft, smooth and a comb ran through it…without breaking! I was pretty impressed with my new hair. I felt renewed and trust me to leave it flying so I could torment people with its length. It wasn’t until I got older that I realized why I felt good about my relaxed hair. I will get into that in a bit. I was told to ‘retouch’ my hair once a month to get rid of the ‘undergrowth’ and ensure that my hair remains ‘beautiful’. I knew I was not going to do what was suggested. Why in the world would I want to go through that pain EVERY MONTH?! I decided that I would retouch my hair once every three months. By the time I was in 200L, I was tired of the pain I had to face every time I retouched my hair, so I pushed it to once every six months. By 300L, I was not retouching my hair at all. The relaxed hair fell out after months of neglect until only the tips of my hair were ‘relaxed’. When I got to 400L, I decided I would brave the pain again and relax my hair. I went to my stylist and after much consultation, she advised me to get a relaxer kit. She assured me it would not be as harsh as the other relaxers I had used. I did as I was told and had my hair done. Did it hurt again? OH HELL YEAH! Maybe even worse! I didn’t have as much burns and injuries as I did before but it still hurt like hell. I didn’t know if I was going to be able to continue this process. Yes, my hair was softer, easier to manage and straight (as was the trend of the time) but it meant I had to nurse wounds for days after every touch-up. In 2012, just before I graduated from the university, I became more aware of what I wanted to do with my life. I started to see Africa as it was, as it is….and as it can be. I knew I was going to work on issues surrounding racism, especially as it affects Africans and people of African descent. When I made this life decision, I knew I had to work on my self-worth and esteem. That included accepting my physical traits just as they are. It was on that day that I decided I was never going to relax my hair with chemicals again. For a second time, I let the old hair fall out. This time though, as the new hair started growing, it came out tougher, coarser and much thornier than ever before. By this time, the #NaturalHairMovement had gained momentum and almost every black girl was going natural. I usually don’t like to do things everyone is doing so I felt like retouching the hair again. That would have been an excuse to renege on my new decision and I knew it. Another option was to do the ‘big chop’ but with my big body, I would have looked weird. I have never had low cut and I really don’t think I can pull it off. That is one side effect of loving ONLY big hair! Anyway, I just let the relaxed hair fall out like the last time until it became completely natural. It has been about 4 years now and underneath any weave, attachment or hair tie is my natural hair. It is glorious and I really love it! This is where the story gets interesting. I get lots of criticism for keeping my hair natural. I keep hearing how my hair is ‘unkempt’, ‘bushy’, ‘dull’, ‘ugly’, ‘unappealing’ and other such adjectives. This happens everywhere; at work, in church, among friends and among ‘friends’. Sometimes, the pressure is enough to spoil my mood, but most times, I just reply by asking these people how my hair texture affects their lives. It gets worse when I go to the salon. The stylist would complain about the texture of my hair and in some cases, charge me more than most other customers. I went into a salon one day and the assistant threw up such a fit because I told her I would not ‘stretch’ my hair before plaiting. She kept shouting and saying, ‘She would not plait this bush oh’. I was pissed off but I didn’t quarrel. I just took my things and left. It was my money after all. My sisters – Enigbe and Sadiya – are also rocking their natural hair. They tell me they face the same problems when they go to the salon. It therefore seems that the world has cooked up this grand scheme to discriminate Africans based on our hair. This is not the first time; in fact it has been happening all through history. From the moment our colonial masters touched down on African soil, they sold us a notion that EVERYTHING about us was dirty, ugly, unappealing and wrong. They told us all our physical attributes were savage, unevolved and primitive. For centuries, we have been told that we CANNOT be beautiful and we cannot set beauty ideals. This has pushed us to copy everything from the other races in order to fit in; and sometimes, at the detriment of our lives. Putting all of these into context, I don’t feel bad when I get compared to a slave or declared 'local' because of my natural hair. That one na your business! You see, I am keeping my natural hair because I am making a statement. I am affirming that Africans don’t have to kowtow to a white man’s definition of beauty! I am saying that we need to love ourselves, and this is about more than just hair. I am saying that we do not have to be light skinned, thin lipped and thin bodied to be beautiful. I am declaring that though our hair may be difficult to comb, methods have been devised to soften our hair without losing its originality. (Isn't it surprising that the same things that are negatively critiqued in Africans are the very things applauded in other races? Well, that is a story for another day). This is kinda my middle finger to anyone who thinks they have a say about MY hair. This is also to tell ladies who have made similar decisions about their hair; you are not alone! We are our hair. We are our skin. We are our noses, lips and thighs. We are black. We are African. We are also our minds, our cultures, our ethics, our hope, our dreams, our achievements. We are our flaws, our failures, our evil and our losses. We are Africa. We are all these….and so much more! This is my new anthem! Thank you so much! I am grateful. And yes, the entire blog is focused on issues affecting Africans, with the view to promoting Africa in positive lights!